Vintage Band Festival 2017 will celebrate musical traditions spanning more than a century on July 29 in Downtown Northfield, MN. 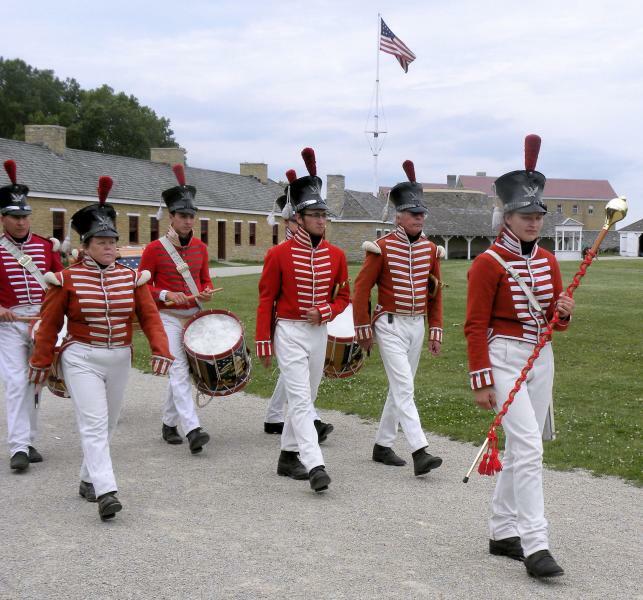 At the beginning of the day, we will be showcasing the Fifes and Drums of Historic Fort Snelling. At the end of the day we will be welcoming McNasty Brass Band to the stage. Both of these ensembles are performing for the first time at Vintage Band Festival. The Historic Fort Snelling Fifes and Drums is a volunteer musical ensemble dedicated to representing the fort’s long history through music. The corps performs concerts and field shows in the fort on selected Saturdays from late May through mid-August. The corps also performs in concerts and parades in the Twin Cities area. Our goal is to gain a national reputation by performing throughout Minnesota and participating in fife-and-drum musters and clinics across the country. Founded in 1971 when the historic site opened, the Historic Fort Snelling Fifes and Drums took a hiatus after only a few years. Music duties at the fort were handled by the interpretive staff, but their performance opportunities were limited. The full corps was revived in 2014 using staff musicians and student volunteers. The musical repertoire now spans from the Revolutionary War through World War II, the years when Fort Snelling was an active post of the United States Army. 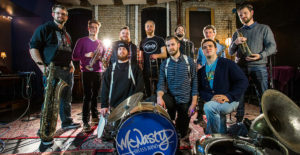 Each player works tirelessly outside McNasty Brass Band as a side-man, some with national and international touring acts. That’s what makes McNasty special– these youthful but experienced side-men come together and showcase their compositions, solos, group vocals, and stage presence as front-men. 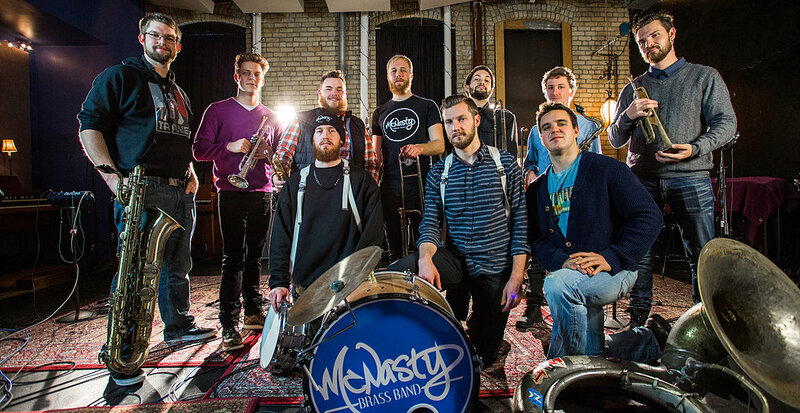 “McNasty Brass Band is a perfect example of why you shouldn’t make fun of the kid who is super into trumpet in 5th grade” (twincitiesmedia.net). “King Size Life,” their first studio album (available January 27, 2017), encapsulates their live energy with exciting compositions, rowdy gang vocals, and rip-roaring solos. The only thing missing is their dance moves! We welcome you to Northfield for the entire 12 hours of the concert schedule. Riverwalk Market Fair will share Bridge Square with us from 9am-1pm. For the complete schedule and information about all of the bands, go to the VBF website. This entry was posted in VBF Bands, VBF News and tagged Bridge Square, Fifes and Drums of HIstoric Fort Snelling, McNasty Brass Band, Riverwalk Market Fair on July 10, 2017 by Dan Bergeson.